Teams flexed their muscles on the way to some lopsided victories this weekend. The 2018-19 season is shaping up to have a similar feel to the 2017-18 season in the Red River's top flight for men's play, as both the Austin Blacks and Dallas Rugby dominated their opposition on the weekend. The Blacks had an insatiable thirst for the goal line as they punished the Dallas Harlequins, 105-3. Over 15 players scored tries for the Blacks in the win, most of the damage was done by inside center Brendan Monahan- who contributed 18 points to the team's total. The Reds had a harder task coming up against the 2017 national champions, and at the time undefeated, Austin Huns. Dallas wasn't fazed and handed the Huns their first loss of the year courtesy of a 50-24 win. The Reds were led by flyhalf Blake Boulton who added 20 points for Dallas. Houston Athletic continued their successful start to the season with a convincing 41-19 win over the Austin Valkyries, giving HARC their second win in as many games against Austin. Bonnie Richardson and Leslie Schroder were both instrumental in the win scoring a double and hat trick respectively. HARC now has a stranglehold on their competition for the rest of the year. Dallas Rugby made it two from two against the Huns on Saturday when their D2 sides replicated, almost identically, the events of the first division game. Reds D2 beating the Huns D2, 54-15. This wasn't the only big win in Division II, Houston Athletic beat San Antonio D2 by the convincing score of 86-0. Leading the scoring was Tom Sargent who dotted the ball down four times in the match. The San Marcos Greys blanked Woodlands rugby 38-0. Joel Cagle and Will Burns did most of the damage for the Greys. West Houston D2 rounded out the weekend with a strong 26-15 showing against Houston United. The Austin Valkyries D2 and Little Rock Stormers both won big against their opponents. The Valkyries did it to the tune of a 83-0 victory against Bay Area Rugby. Chelsey Arambula had her hands in everything scoring five tries in the one game. Little Rock didn't win, as emphatically but their win was still impressive nonetheless- they took down Dallas Rugby 57-10. Erin Gallagher-Johnson scored a hattrick in the process of taking the Stormers to victory. Austin Huns D3 got the club's only win of the day when they won an arm-wrestle against McAllen Knights 27-17. Austin Blacks D3 had no issues taking down Alamo City Rugby as they cruised to a comfortable 77-0 win. 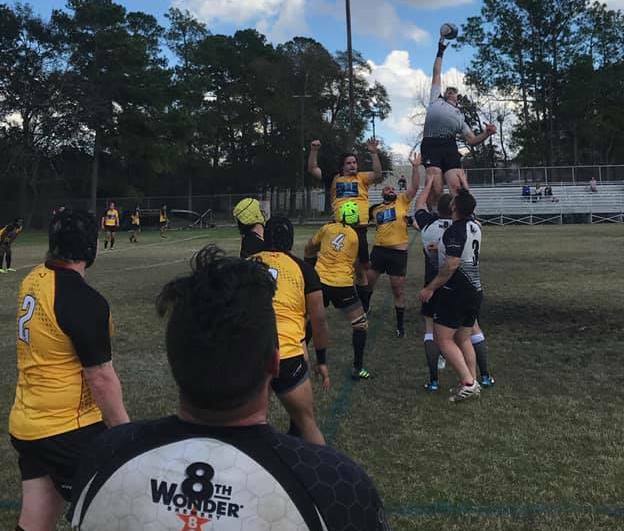 Alliance Rugby more than doubled their opponents, Shreveport Rugby, in an impressive 59-27 display. In a cross town rivalry Houston United outlasted the Houston Arrows 24-17. Bay Area kept Woodlands D3 off the board with a 21-0 shutout victory and Galveston were just a class above the Kingwood Crusaders, handing them a 48-14 loss. Houston Athletic D4 capped off their club's successful day with a 49-17 win over San Antonio D4. Grand Prairie Mavericks D4 squeezed out of a tight one against Dallas Athletic D4 thanks to a last second try from Zain Siddiqui and conversion from Drew Wasikowski; winning the game 47-45.